The S-B: WHAT WOULD THE SCHIAP DO? Elsa Schiaparelli has been having something of a moment. Albeit a long overdue moment. 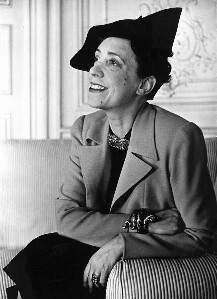 A contemporary of Chanel between the wars, unlike her rival, Schiaparelli's name, if not her work, fell from sight. Then something happened. First, in 2006, Diego Della Valle, owner of Tods, bought her trademarks and archives, announcing a renaissance of the label in 2012. Then an "impossible conversation" was imagined between Schiaparelli and the designer who is, perhaps more than any other, the inheritor of her mantle: Miuccia Prada. Both women iconoclasts, both art lovers, both more interested in stretching boundaries than operating within them. And so, the Schiap was firmly back on the fashion map. I confess that, other than Schiaparelli pink, I knew shamefully little about Schiaparelli until that stunning exhibition of the two women's work at the New York Metropolitan Museum of Art. So I was fascinated to read a quirky new memoir by New York writer, Patricia Volk. Entitled The Art Of Being A Woman, it must have taken all the publisher's willpower not to call it What Would the Schiap do? Because fundamentally that is how Volk lived her life from the moment she discovered Schiaparelli's biography, Shocking Life, as a child. Just as Volk was examining and rejecting the blueprint for domesticity and femininity laid out for her by her mother, Audrey, the very picture of 1950s upper east side perfection. Schiaparelli's most famous fragrance, Shocking, is the scent of Volk's mother - gifted to her annually on her birthday, January 21st, by Volk's father - but that is where the similarities stop. Audrey stands for perfection and glamour, conformity; she is proper. And she sets about imposing those mores on her daughter. Schiaparelli, on the other hand, prided herself in taking all those things and standing them on their head. 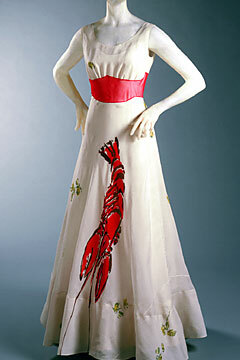 Her Dali collaboration, the Lobster dress (below), the very antithesis of all things Audrey. Under the guidance of these two contrasting notions of just about everything - from frocks to lipstick to getting, and keeping, (naturally), a man - the young Volk embarks on a quest to discover her own style, her own way of being a woman. Illustrated with photographs and memorabilia, this nostalgic look at 50s Manhattan is not for everyone (show me a book that is). But if you have even a passing interest in fashion history then you will love this homage to a woman who shaped the way we dress far more than she is credited for. "There has to be more than one way to be a woman...' Says the cover blurb. "And if there is more than one way, chances are there are many." And so it turns out. I think the Schiap would be proud.